Come with us now as we return to the inscrutable orient to meet five cute characters who are actually deadly martial arts experts; these are the 5 Ninjas of this Eyecon online slot machine and this is a game filled with bonus features. 5 Ninjas is a five reel slot with three rows and up to twenty five paylines; those reels spin on the walls of a wooden building constructed in Japanese style and the backdrop to this structure is dense forest stretching into the distance. 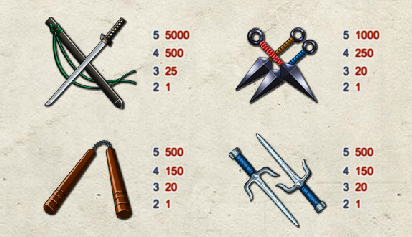 All the symbols are related to the theme and include various weapons – a sword, throwing knives, nunchucks and standard knives; the five ninjas represent the lower values. The wild symbol is a bomb which appears on reels two and four only and substitutes for all others to make winning combos except for the element and coin bonus/scatter icons. The wild will also double and wins to which it contributes. This is triggered by landing three or more of the coin scatter symbols anywhere in view; you will now receive ten free spins with all wins tripled. During this round all the coin symbols are replaced by opponents and by ‘defeating’ ten of these characters you can earn ten extra free spins. A maximum of 150 spins are available. This is randomly awarded during the base game and it’s a picking round in which you make three selections, each of which pay up to 100x the total stake. Element symbols appear on reels one to five and when they land the element area above that reel lights up and remains lit for five more spins; if you manage to light all five at the same time then this bonus is triggered. You will be shown five doors and all you have to do is pick them in turn to release a ninja and receive a prize of up to 200x your total stake. The round ends if you find a guard behind a door or all five doors are opened. Each win can be gambled by clicking the ‘Gamble’ button below the reels; you can now play a double up game by correctly picking one of the two elements on offer; there’s a win limit of £32k or five correct guesses. 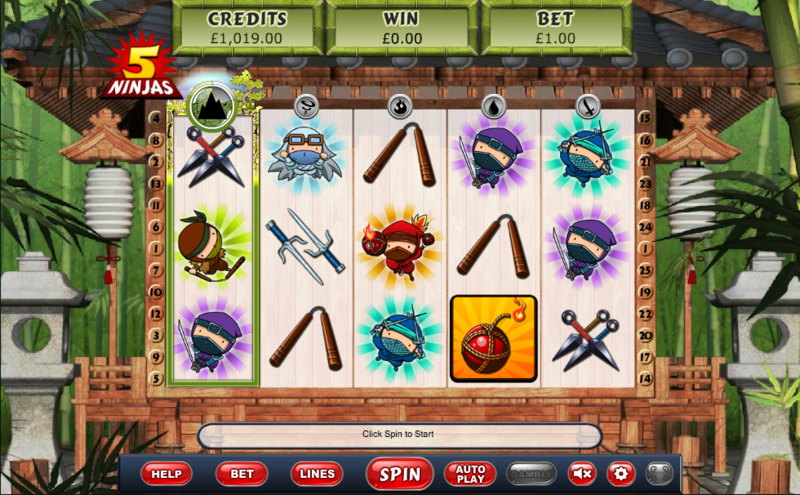 There’s plenty of bang for your buck when you play 5 Ninjas – it’s a slot with a lot to offer and some cute, high quality graphics into the bargain. It comes with an RTP of 95.20% and is well worth checking out.